Home » Adam Arnold’s work-life blog » Media » The Dale Farm eviction: where next? Dale Farm has been making headlines since its residents lost an appeal in the High Court, surrounding their right to stay on the Oak Lane site (Crays Hill, Essex). If you’re unfamiliar with Dale Farm, this entry on Wikipedia provides background on the largest Irish Traveller site in the UK, as well as up to date news articles on the pending eviction. Out of respect for those people who will lose their homes, I’m not going to give any opinion on the event itself. Instead, I want to flag up an article I received from the Sheriffs Office, which raises a very valid point: where will the travellers go next? Readers of the Daily Mail will no doubt point to secret property empires back in Ireland, however it’s possible that some of the travellers will end up on other patches of land in Essex and the surrounding areas. The article below details some of the options available to land owners in the event they find themselves housing former residents of Dale Farm. 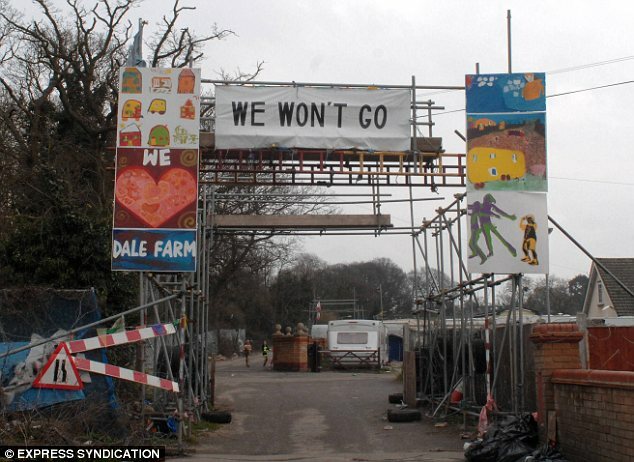 As you may be aware, the eviction of Dale Farm in Essex is due to take place on Monday next week. The Sheriffs Office has been advising the East of England Gypsy and Traveller Liaison Officers group on how to manage the repercussions of the eviction. As the repercussions may affect you or your clients, I thought you might appreciate a summary of our advice to this group of representatives from local authorities. While some of the residents of Dale Farm may choose to accept accommodation from the local authority, it is very likely that the majority will move on to other sites such as farms, playing fields, car parks or other land, within Essex and bordering counties, possibly beyond. There is a very good chance that the residents have already identified sites they plan to occupy, some owned by local authorities, others by private landowners. If you or your client own a site that could be a target, I would strongly advise you to secure it now to prevent anyone from gaining access. If anyone does move in to occupy the land, you should act quickly to have them removed, before eviction costs escalate and lost revenue from the land mounts. You will need to obtain a court order under Part 55 Civil Procedure Rules, then High Court Enforcement Officers (HCEO), can enforce the eviction using a Writ of Possession. HCEOs can act quickly to enforce, within hours of receiving the writ, unlike county court bailiffs who are increasingly stretched and may not be able to act for several weeks. At The Sheriffs Office, our procedure is to carry out a risk assessment, so that we have a detailed understanding of the site, the situation and the resources required, including any specialist equipment. We also advise on security measures once the site has been cleared to help prevent a return to site. Once we have the writ, we agree with you when the enforcement will take place and whether to give notice to the occupants. We are under no obligation to give notice to the occupants, however in some situations it may be advantageous to do so. We also liaise with the Police and ask that they assist us under Section 99, Schedule 7 of the Courts Act 2003. Once the site has been cleared the usual procedure is for either our client or their representative to sign the writ, to indicate that they have taken back possession of the land – this then “closes” the writ, making any further enforcement impossible. However, given the sensitive nature of these possible evictions, we are happy to keep the writ unsigned for up to 36 hours. This means that, should the site be re-occupied during this time, we can immediately start enforcement again without the need to go back to court for a writ of restitution (further costs apply if re-enforcement is needed). A landowner or their agent can instruct a Certificated Bailiff to remove trespassers from land without a court order under Common Law. However, Common Law evictions can only be used by private landlords and the Land must be identified on a Land Registry Map or Local Authority Plan. At The Sheriffs Office, we act for clients under Common Law, as all our officers are also Certificated Bailiffs. Just as with an eviction under a writ of possession, we carry out a risk assessment, agree details with the client and liaise with the Police to effect a swift and speedy eviction. If you have any questions or know of a site at risk, please do contact us for further advice. In the unfortunate event you are affected by the the Dale Farm eviction, I would suggest contacting the Sheriffs Office via their website.